Mike, yes the Dana Hi-Performance Center sold a few brand new Italian exotics as well as a brand new 1966 Shelby GT-350, which Peyton Cramer was able to get because he worked for Shelby prior to opening Dana Chevrolet. True or not, it is interesting to see the claim that they have built thirty-two 427-powered Camaros up this point. If so, where are they all? 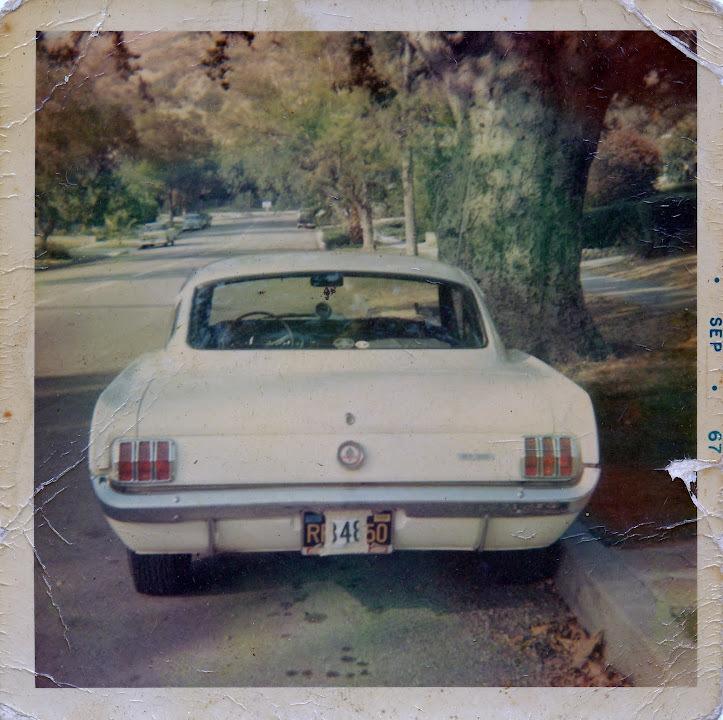 By the way, here is the business card that was found in the glove box of the '66 GT350 that Jon is referring to. The car was sold to Dana as a demo at a 20% discount. It had been used at Shelby American as a company lease car. Dana apparently kept the car a year before it was sold to the first retail owner. Also here is a picture of the car shortly after the first retail owner picked it up. It's a bit difficult to see here, but that's a Dana Chevrolet license plate frame. Welcome to the CRG Brant. very cool pics. What became of the car, and how did you get the pics? I've owned the car since 1999 (after trying to purchase it since 1985). The restoration was completed in 2017. The first retail owner is still in our area and brought me the print posted along with a couple of others. BTW, if anyone is interested, much of the restoration is documented in our Blog. You bet we're interested! I'm gonna read that blog to death! Brant, thanks for posting and contributing to our knowledge of this highly regarded dealership. You are welcome here anytime. It's interesting that Dana hung onto the car so long before selling it. 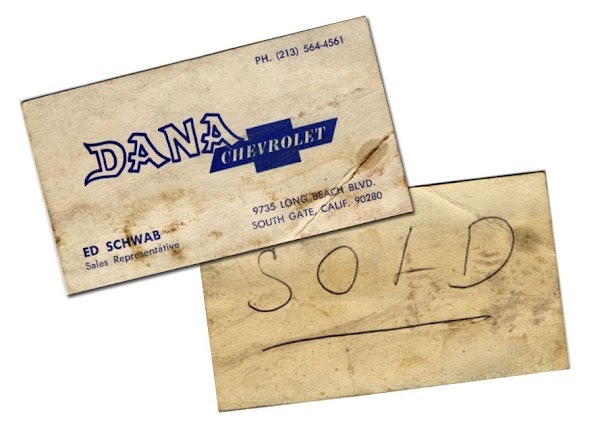 Did you ever try and see about contacting the original salesman or anybody else who worked at Dana at the time? I have often wondered that myself, but other than some quick Google searches, I really did not know where to start. I have no contacts for folks who may have been there during that time. 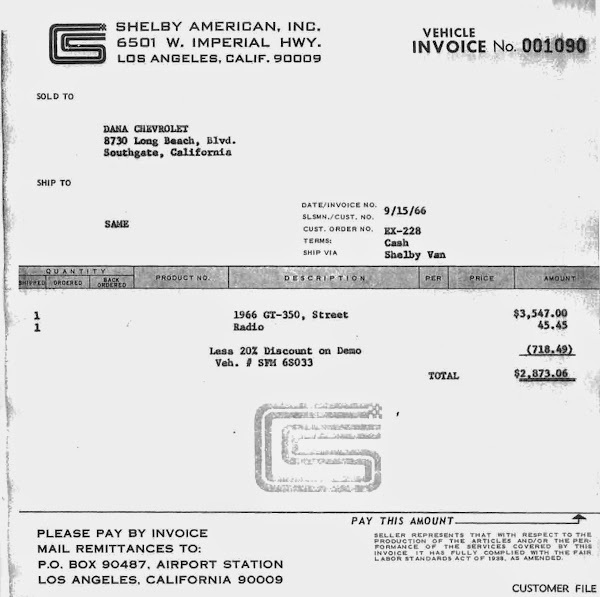 I believe the car was quite "used" at Shelby American before it was even sold to Dana. There are records showing that it was leased to the general manager at SA (his son drove it), then to a gentleman who worked as a painter there, and then to a Ford designer who was working on the prototype '67 Shelby. I have been in contact with the first two guys mentioned. All of this information comes from records from the '65-66 registrar with the Shelby American Automobile Club. Fortunately, they have tons of records on these cars. It's quite helpful. If any of you guys have some information about its time at Dana Chevrolet or the salesman, Ed Schwab, it would certainly be appreciated. Not all Ford dealers were Shelby American dealers, so it obviously was quite unusual for a Chevrolet dealer to receive a car. Again, I am guessing that came from the Peyton Cramer connection. Strangely enough, this car was not the only '66 GT350 delivered to Dana. I would have the check the Registry, but there were others. Brant, that is one of the great things about the Shelby cars. They seem to be very well documented. I assumed your car was the only GT-350 to get sold to Dana Chevrolet so it's extremely interesting to hear there may have been others. No doubt it was due to Peyton Cramer's presence. Would any of them have been '67 or '68 Shelbys? I have some potential contact info for Ed Schwab and I'll email that to you. P.S. What's the story on back-up lights? I see your car doesn't have any. I re-visited the fact that other GT350s were sold to Dana. 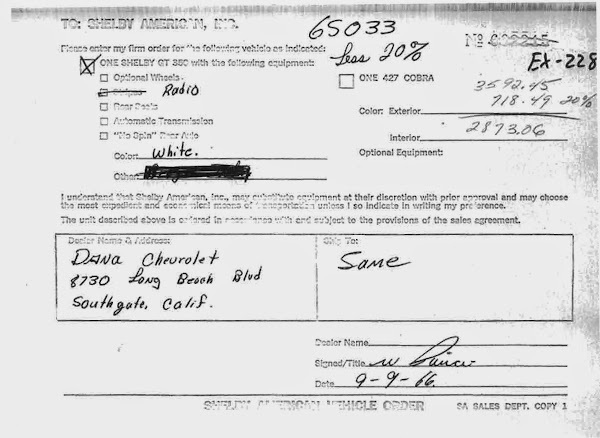 By just looking at the Registry, it would be difficult to go through all of the entries to determine how many cars were sold to Dana. The 65-66 registrar, may be able to "sort them" and give me a list. I would also have to look into the '67-68 models, although I'm much more familiar with the '65-66 cars. I did look up the other '66 that I knew was sold to them. It too was sold as a demonstrator. I'm guessing that all of the GT350s that Dana got were basically used cars, rather than brand new units. While there was a relationship there with Peyton Cramer, it would have been unusual for SA to sell a brand new GT350 to a non-Shelby dealer, much less a Chevrolet dealer. The back-up lights? Great observation! Shelby American needed to release the new '66 GT350 models in the fall of 1965 when all of the '66 model cars were introduced. Since no '66 Mustangs for SA to modify were being produced until late in the summer of '65, they needed some cars to get ready. 252 1965 Mustangs were ordered from Ford to be modified into the first '66 GT350s. These started arriving at SA in July of 1965. As stated, they were actually '65s with 1965 Ford VINs. They were ordered with the GT gauge package, so they had the '66 style instrument bezel. They, of course, all have '65 style interiors (seat upholstery, door panels, and dash pads were different from '65 to '66). Two groups were ordered with folding rear seats, and the other two groups were ordered with rear package trays which were unique to the '66 model GT350s. BTW, most all of the '66 GT350s had rear seats even though they were listed as optional by SA. Only between 85 and 90 of the total '66 GT350 production had the rear package tray. Back to the back-up lights...they were optional on '65 Mustangs, and no '65 GT350 had them. All of those 252 cars did not have them either. Thanks, Brant. I appreciate the extra information on these cars. I found it interesting to see the Cragar van parked at curbside and saw that Dana had a display right in their showroom featuring Cragar mags. I subsequently found out that Cragar Industries was also a Southgate, CA business and only 3 to 3.5 miles down the road. Two local businesses supporting each other. Since Peyton Cramer had previously worked for Shelby and Cragar mags had been optional on the '65 GT350, this was a very natural continuation. No doubt a fair number of Dana cars got sold with Cragar mags and maybe even Cragar headers on them. More pics of the Dana Chevrolet Hi-Performance Center at 9735 Long Beach Blvd. Both Trans-Am Camaros shown in the last shot still exist and the white one should be fully restored in 2019. Both went to Sebring in '67 with full sponsorship from Dana. FWIW we did a TV interview with Peyton Cramer back around '89-'90 for his Shelby connection concerning the GT-350 Hertz program. The video was called "Mustang Video Magazine"
Just another T/A fanatic. A new project in the works.